The SPX made a new all-time high yesterday, which resets the wave count at one degree, however, I continue to feel that the 1600 zone is an important inflection point and that there's good potential for a turn here. We also have the FOMC announcement coming up today, which adds to the possibilities for an inflection point. In my perfect world, I'd like to see the market embark on a deeper correction in the near future and begin to unravel some of the fourth waves which need to be unwound. Since all I've talked about for the past couple weeks is the idea of a decent intermediate correction developing soon, I've also updated the big picture chart, with a focus on the bullish long-term wave count. From a big picture standpoint, I would consider myself neutral at this exact moment. I was bullish up until recently, but I'll be the first to admit I make a terrible bull, and the potential of a triple top here is hard for me to ignore. Especially since I'm fundamentally bearish on the massive systemic debt the world has accumulated, and believe that the only "reason" to be bullish is because the Fed has created another bubble by pumping ridiculous amounts of liquidity into the market. Since I do believe this is a bubble and that it will ultimately end like every other bubble does (i.e.- POP! ), I intend to watch corrections carefully to try and determine if they are only corrections, or if they are the start of the popping phase. 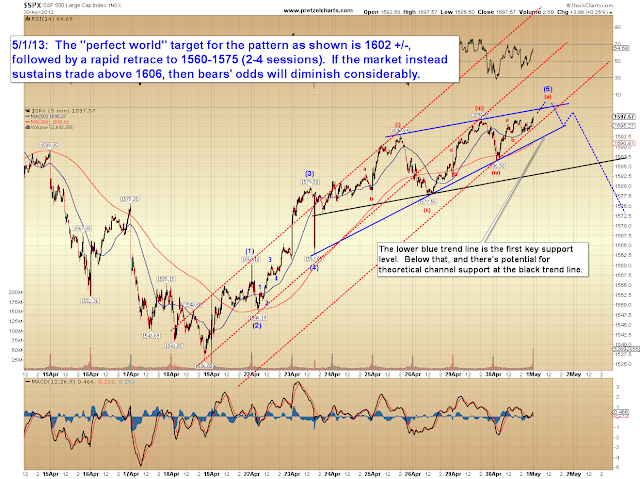 Unless SPX can sustain trade above 1606, I continue to feel that an intermediate correction remains likely. The chart below also roughly outlines the longer-term bull count at this stage -- to be honest, the long-term bear counts are a bit spotty with the market in this position, hence they bear the alternate labeling (red "alt.") and are not detailed on this chart. 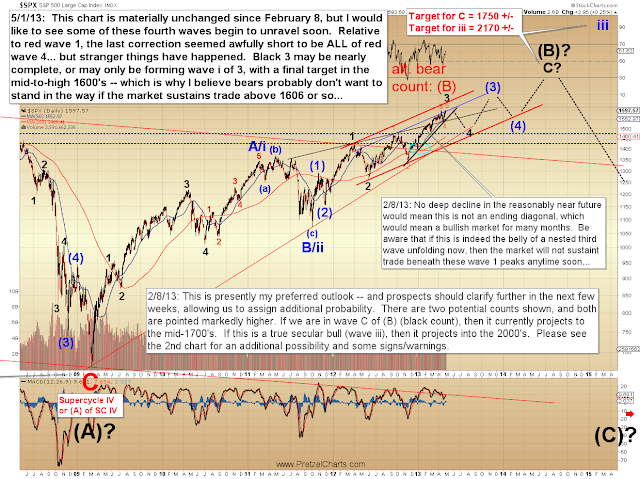 They would jump to the fore if any forthcoming corrections were to overlap the black wave 1 peak. From a near-term perspective, my preferred interpretation of the pattern is a bearish ending diagonal (shown below). To position this in the chart above, this wave would represent red 5 of black 3. It's worth noting that this wave does not need to go any higher. Fifth waves in ED's can be quite unreliable, and it has already fulfilled the minimum requirements. 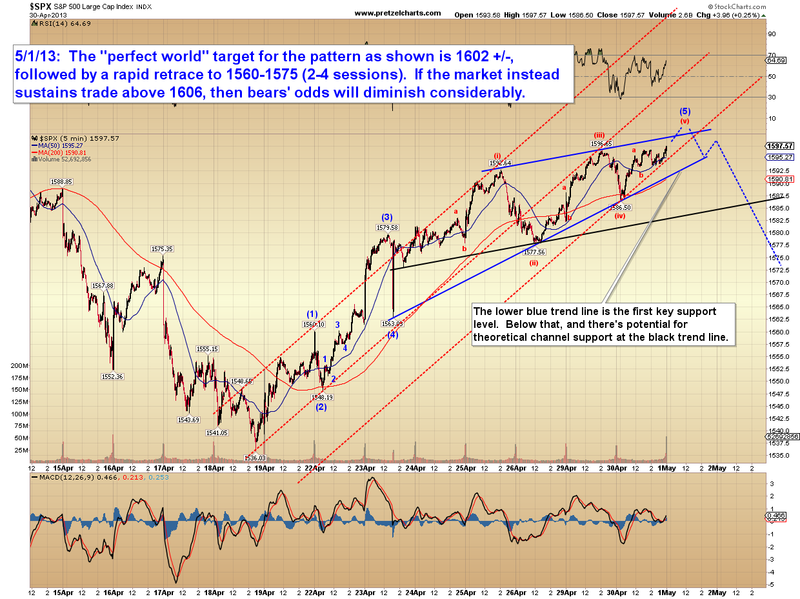 Since we have to be aware of the if/then nature of the market, this pattern would be called into question if the market were to sustain trade above 1606. If that were to happen, there are several bullish options we'd need to consider, including the potential that this is wave i of red 5, which would target the total wave toward the mid-to-high 1600s. From a classic technical analysis standpoint, the pattern is a cup and handle, which further argues bears should probably get out of the way on a sustained breakout. In conclusion, the 1600 zone remains an important inflection point, and I still feel the odds are good that an intermediate correction will begin in the near future. 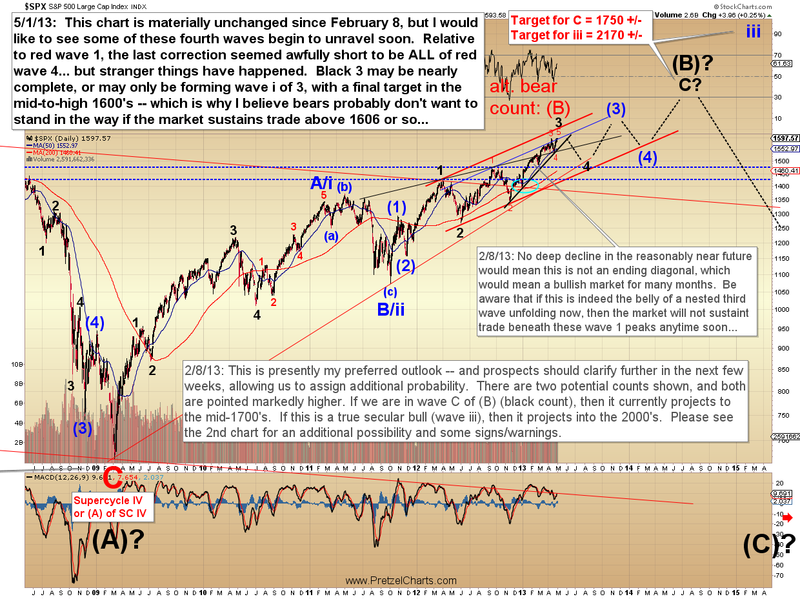 If the market instead sustains trade above 1606, then it will be time to re-examine that outlook. Trade safe.